When is the best time to buy a car? Overused marketing pitches. When is the best time to buy a car? Overused marketing pitches. 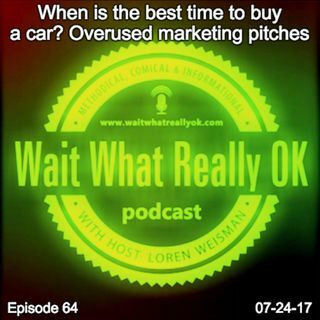 Wait What Really OK Podcast Episode 64 hosted by Brand Precision Marketing Strategist and Counselor, Loren Weisman talks about those sale and marketing tactics that are used over and over again. Have you ever experienced those ads that come on saying the best time to buy a car is now, only to hear the same basic advertisement a month later? This overused, overhyped and over done tactic is losing steam and annoying people more ... Más informaciones and more. This is one reason why avoiding this tactic and working to strategize a message that can branch out over time and not sound redundant or repetitive will serve you better while helping to keep those engaged longer. It also aligns with avoiding some of those same selling images too often as well. From the words, you use, to the images to the videos and everything else, work to keep it fresh, while you share the same foundational message. Ep 64 “When is the best time to buy a car? Overused marketing pitches.” of the Wait What Really OK Podcast is available on iHeartRadio. Podcast Blog Supplement for Episode 64 of the Wait What Really OK Podcast with Loren Weisman. Podcast Link Supplement for Episode 64 of the Wait What Really OK Podcast with Loren Weisman. Who is the best guitar player ever? It’s not who you think! Podcast Video Supplement for Episode 64 of the Wait What Really OK Podcast with Loren Weisman. Podcast Photo Supplement for Episode 64 of the Wait What Really OK Podcast with Loren Weisman.